In the end, it was quite a snap decision. ‘Why don’t you just buy the Peugeot off me?’ I found myself saying, as I discussed yet again the bike that a friend was going to buy. ‘I’d love to – that would be perfect. I like that bike.’ came the response, and it was done. The bike that got me back into cycling, that got me fit again, that I had spent more time cherishing and working on than any other bike I have ever owned, the bike I felt most sentimental about – gone. It all started about six months ago, when a colleague from work was toying with the idea of riding to work. Never one to let an opportunity to get another cyclist on the roads go by, I immediately offered to lend him a bike to give it a go. So he took the Peugeot, along with my SPD shoes (!) and gave it a try, commuting from the north shore to North Sydney. Of course, he soon got hooked. ‘I smashed it this morning’, he would enthuse. ‘Passed the bus really early on, and just cruised in. So much faster than driving!’. And then later on, ‘I passed my first person on the hill up the Spit today. I’m officially no longer the slowest person on the road!’. And when he started arriving in his cycling gear in the pouring rain, I knew he was terminally addicted. And we kept discussing what kind of bike he should buy. We both drooled over Masi, and discussed the Surly LHT. We went to shops, and they never seemed to have what we wanted in stock. People failed to call him back with prices. I even found the perfect bike for him – a Salsa Vaya – in stock in a city bike store, but when he went there for some reason the assistant showed him some cheap commuter and he came away disillusioned. Maybe it was the gods intervening, but it just seemed really hard for this guy to buy a bicycle! In the meantime, he was riding the Peugeot to and fro. And loving it. Even a snapped chain going up the Spit wasn’t enough to put him off. So when we yet again got to talking about a bike for him, I suddenly made my rash offer. “I love that bike’, he said. ‘That would be perfect!’. So the deal was done. My muse had moved on. Perhaps its work was done. It had got me fully addicted, and the owner of a stable-full of bicycles. It was time for it to do its magic on someone else. And perhaps, just perhaps, in the future when my friend is choosing which of the six bicycles he now owns to ride to work in the morning, and he sees someone else looking to try riding, perhaps it will be time for the Peugeot to once again move on, to enthuse another novice rider with the joys of cycling. 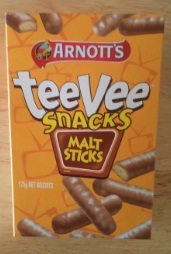 I should probably admit something, given that I’m on I think the third variety of TeeVee snacks. I actually do not own a TeeVee. Yes, I’m sure that completes the picture you have of me; a stereotypical inner-west-living, bicycle-riding, organic-veg-buying loon who spends the evenings playing ludo by candlelight. Well, actually, you’d be dead right, I do do all of those things, and I am aware that it might put a degree of bias into my review of Arnott’s TeeVee snacks. 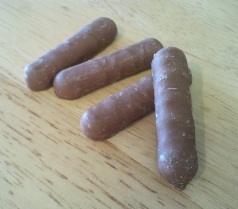 However, you can rest assured, dear reader, that I settled down in front of some of my favourite YouTube clips to sample the Malt Stick variety, in order to test these biscuits in the manner for which they were designed. And they work really quite well. Nice and crunchy, but not too much so that you can’t hear the sound. A good size for chomping on, with the shape being easy to pick up and eat without needing to take your eyes away from the screen. And quite tasty, but without being too challenging or unusual such that your concentration might be drawn away from the entertainment. Not bad at all. I’m going to give these a six out of ten. We’ve recently started buying vegetables from Sydney Food Connect; a social enterprise that aims to connect farmers to urban consumers. One of the nice things about it (apart from the delicious produce) is the way that the number of ‘food kilometres’ is noted on each item, with the aim being to keep the average lower than 100km. 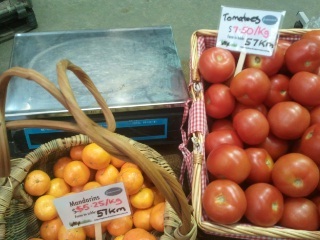 Who’d have thought that there were tomato and mandarin farms only 57km away from Sydney City Centre? 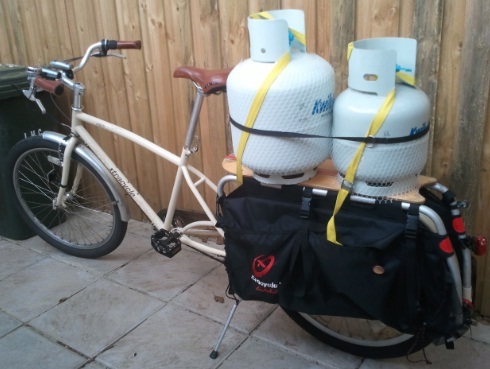 Of course, I go and pick up our vegetable box each week on my bike – this means the veg gets a few extra kilometres, albeit a very eco friendly few kilometres. To balance this, however, I also recently picked up a double load of fossil fuel on the Radish. This made for quite a heavy load to get back up the hill to where we live; I got a few double takes as I slowly made my way along the road! Science has rather a good track record when it comes to being right about stuff. Crops fail because of disease or pests, not because an incorrect sacrifice was made to the gods. Copernicus was right, whatever the Catholic church might have said. Antibiotics work much better than praying for a miracle cure. Indeed, the reason you can read these words is because of the careful, steady work of generations of scientists, working to understand electricity, chemistry, mathematics, information theory and a thousand other disciplines, each building on the work of those that went before to create the fantastically complex thing that is the internet, an achievement beyond the imaginings of an alchemist or shaman. However, it has often been said that science has nothing useful to say about values and morals; science is about facts and things, and cannot shed light on questions such as ‘what is good’? It’s a commonly held position, expressed perhaps most eloquently by Stephen Jay Gould with his ‘non-overlapping magisteria’; in this worldview questions of morality properly sit within the religious realm and are entirely insulated from scientific enquiry. I’ve never been especially convinced by this argument. Why can’t the scientific method – a method that has proved itself to be the most effective means devised of answering all sorts of questions – also be used to investigate questions of morality? Why are values and ethics immune from rational investigation? Such attempts that have been made to do this have predominantly come from philosophy, with varying degrees of success. Anyone familiar with the work of Peter Singer can appreciate the way ethical questions yield to the incisive application of logic, and do so in ways that are frequently uncomfortable and confronting. Popular philosopher AC Grayling tackles the very question I posed earlier in his book ‘What is Good?’. But for all these positive examples, there are also less useful contributions. The shadow of David Hume still reaches us from the eighteenth century, the precursor to the kind of woolly moral relativism that asserts that any moral judgement is purely contextual, and as such there are no absolute moral or ethical truths merely societal norms. It is into this battleground – between the absolute claims of religion and the over-cautious liberal relativists – that Sam Harris throws himself. His thesis is simple – that questions of morality are entirely amenable to examination by the scientific method; that such examination is already possible in rudimentary form today; and thus it is already possible to start to lay the groundwork for a moral framework based on objective truth, rather than subjective opinion. He further contends that, whilst today this may be somewhat crude, there is no reason to suppose that, with appropriate scientific investigation, this could be refined to produce a clear, objective view of how we ought to live our lives. 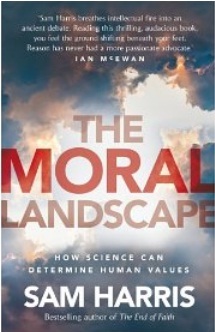 Morality, he argues, can be thought of as an underdeveloped branch of science. The challenge in such an endeavour is to frame the question of ‘morality’ in such a way that it can be examined scientifically. Harris does this by noting that our being ‘happy’ or experiencing ‘well being’ is in fact no more that a particular arrangement of chemicals and neurones in our brains that gives rise to those feelings; and that further those arrangements come about as a result of external stimuli. These things are facts, and as such can be studied scientifically. If we can understand both those brain states, and how they are linked to external events, we are in a position to be able to maximise well-being through the organisation of ourselves and our society to ensure such brain states are most commonly delivered. It is undoubtedly reductionist, and may even sound Orwellian, but it is a fascinating argument. The pursuit of happiness and the common good is one that has occupied humans for centuries, and Harris’ approach simply adds an objectivity to the quest that may help to determine whether approach A or approach B is more likely to result in the desired goal. Harris is suitably cautious over whether a genuine absolute answer to such questions can be found; however as he points out the fact that an answer is not practically achievable does not make the question unscientific, nor preclude that in striving to answer it progress will be made. Indeed this is virtually a description of the scientific method; science is a process by which understanding of something is incrementally gained, rather than a way of delivering absolute truths. In laying out his thesis, Harris takes the reader on a journey thr0ugh research into the brain activity relating to moral questions, into entertaining demolitions of various religious and philosophical viewpoints and includes intriguing questions about free will and the nature of good and evil. Some parts of this book had me standing up and shouting ‘Yes!’, whilst other parts caused much head scratching. Whatever side you take in the debate, this is a thought-provoking book worth reading.